MANILA -- Senator Antonio Trillanes IV will have his status reverted to that of a military personnel following the invalidation of the amnesty granted to him by former president Benigno Aquino III in 2011. This was disclosed by Armed Forces of the Philippines (AFP) spokesperson, Col. Edgard Arevalo, in a press briefing Tuesday. "The revocation (invalidation) of the amnesty issued by the President (Rodrigo Duterte) effects 'ab initio', effectively bringing him back to his former status as military personnel. That being the case, he will again be subject as he was subject of military regulation, including the Articles of War which every military personnel in the active service is supposed to be subjected to," he added. Prior to his election as senator in the 2007 elections, Trillanes was lieutenant senior grade of the Philippine Navy. Based on Proclamation No. 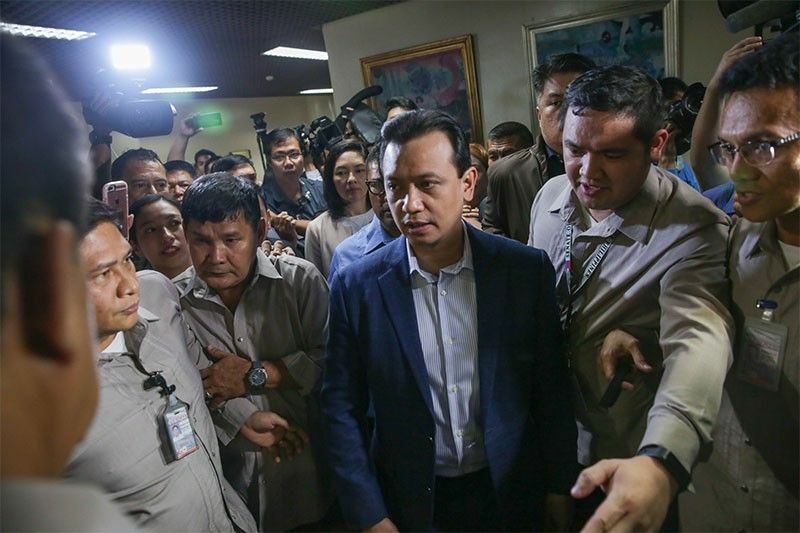 572, Trillanes, has no pending application for amnesty granted to all active and former personnel of the Armed Forces of the Philippines and supporters who joined the July 27, 2003 Oakwood Mutiny, the February 2006 Marines stand-off, and the Nov. 29, 2007 Manila Peninsula siege. In this regard, Arevalo said, the court martial against the senator will be continued. "Remember it was just stopped because of the supervening event that is in the case of the amnesty which was given to him and which is now at issue. That’s why nahinto ang ginagawang proceedings (the proceedings were stopped). Now, na-revoke iyong amnesty (that the amnesty was revoked) ab initio, meaning from the beginning, so he will be reverted to his status as active military personnel subject to military law and military discipline. Therefore, 'yung (the) court martial will have to be reconstituted kasi yung ibang (because the other) members ng (of the) court martial have already retired in which case, the acting AFP chief-of-staff, Lt. Gen Salvador Mison. Jr (vice chief-of-staff), has already instructed the convening of a general court martial that shall be hearing the case of Lt. Trillanes," he added. Arevalo said the court martial will resume where the proceedings were stopped due to the Aquino's Proclamation No. 75, which was issued November 2010 granting amnesty to Trillanes and his companions in the said mutinies. "Ibig sabihin (it means) it is as if he did not retire from the service, he did not file any application for amnesty, kaya balik siya sa (so he will be back to) military custody upang ituloy ang kanyang (to continue with his) proceedings," he added. Meanwhile, Department of National Defense (DND) Internal Audit Service head Ronald Patrick Rubin said the legal basis for the invalidation of Trillanes' amnesty is his failure to comply with basic requirements to file an application, an admission of guilt and expression of remorse. Without these elements, the amnesty granted to the senator is "void ab initio", meaning it was void from the day it was granted because it lacked those critical elements, he added. Proclamation No. 572 stated that there is no file of Trillanes' application for amnesty in the records. Based on AFP and DND files, this seems to be the case, Defense spokesperson Arsenio Andolong said.